NauticStar Boats has added another model to its Legacy series of deep-V center consoles that will please multiple interest boaters: the 2302 Legacy Dual Console. This family-friendly, crossover dual console provides the perfect platform for any on-the-water activity. As a pleasure boat, comfort amenities are plentiful. As a fishing vessel, it includes must-have features for the angler. Yamaha Marine1 tested the 2302 LDC and produced some outstanding performance results. Powered with a four stroke F200XB the boat planned in 3.64 seconds had a top speed of 47.2 MPH with a fuel burn of only 5.66 MPG at cruise. It has a fuel capacity of *85 gallons. Teleflex SeaStar® Pro hydraulic steering with tilt is standard. A beautifully contoured panoramic walk-thru windshield with a folding door separates the bow and cockpit. The plush bow seats are hinged and flip-up to reveal 27-gallon storage boxes on both the port and starboard side. An optional bow filler cushion can be added to form a plush sundeck. Between the consoles, there is a fully fiberglass finished ski locker that also serves as dedicated rod storage for up to five rods. With the acrylic table option, a base is included in the bow and stern for multiple mounting locations. The cockpit features the aft 3-across seating that is the trademark of the Legacy series. The starboard seat has battery storage while the other 2 seats conceal a 42-gallon fish box with overboard drains. The starboard seat-back opens for walk-thru transom which also has a 3-step boarding ladder with SeaDek® on the landing and a freshwater transom shower. A 30-gallon aerated livewell is located in the port aft area within an easy arm’s reach. The galley has a freshwater pressurized sink with Corian top and stainless steel drink holders. It also has an integrated 25 Qt. Igloo® cooler. There are a total of 13 stainless steel drink holders throughout the 2302 LDC. 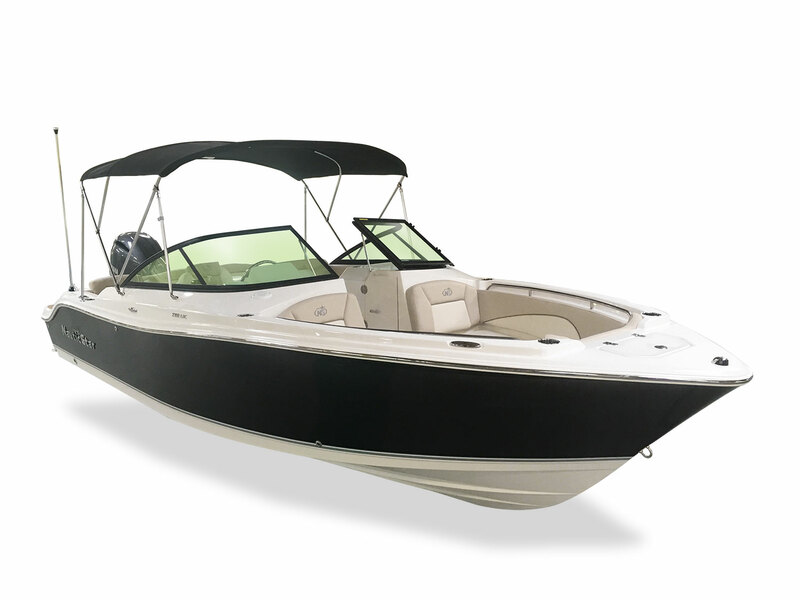 A selection of options are available to further customize the 2302 LDC to fit the lifestyle of individual boating preferences. A few of these include a color matched Bimini top with new quick release hardware, Saratoga weave snap-in flooring, tonneau and cockpit cover, ski tow pylon and underwater LED lights. Completely customizable from bow-to-stern, consumers can visit NauticStarBoats.com to configure their own 2302LDC using the Design Your Boat interface. 2302LDC boats are available now through most NauticStar Boats dealers. NauticStar Boats, now part of the MasterCraft family, was founded in 2002 and is located on 17 acres in Amory Mississippi. With more than 200,000 square feet of manufacturing floor space, NauticStar is one of the top producers of high quality bay boats, deck boats and offshore center console boats from 18 to 28 feet. Professional and sport fishermen, recreational and pleasure boating enthusiast appreciate the many standard and available features that are offered by NauticStar for a customized fit for their lifestyle. 100% wood-free construction and one-piece foam filled stringer system is the backbone of each boat that allows NauticStar to offer a limited lifetime warranty on their boats. For more information on NauticStar Boats’ full line of boats, visit NauticStarBoats.com or call 662-200-4664.